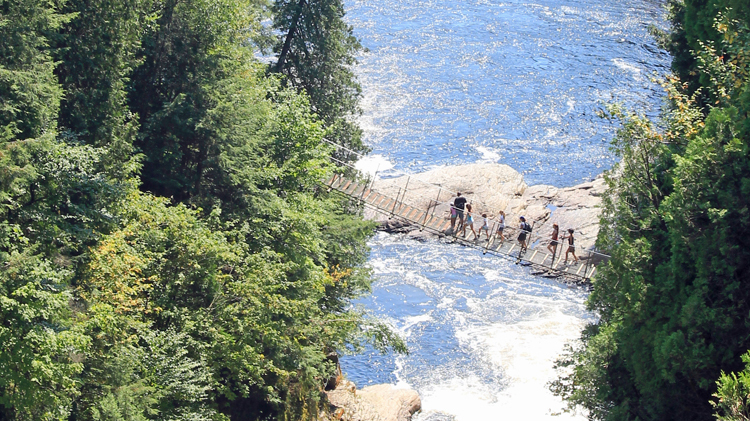 The province of Québec, Canada, offers an abundance of trails with a wide variety of landscapes. There are national, regional and municipal parks offering scenic trails for everyone from avid hikers to casual walkers. In fact, there are more than 6,000 kilometers of trails accessible to hikers of all levels (our kids were 6 and 8 at the time). Hiking is certainly the best way to enjoy all of the breathtaking scenery that Québec has to offer. 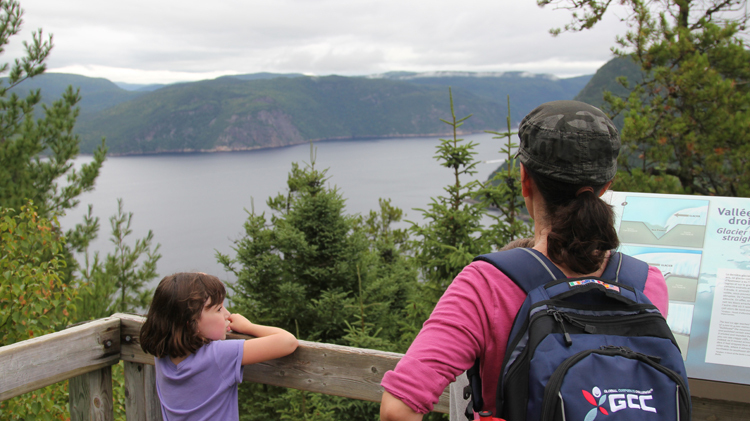 Check out these five hikes for a family adventure you will not soon forget. 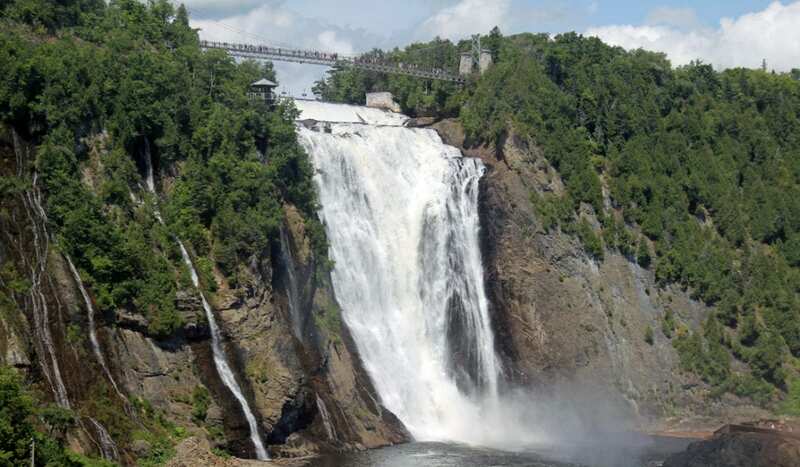 Just a few minutes from downtown Québec City, you’ll find Montmorency Falls Park. Ninety-nine feet higher than Niagara Falls, this spectacular waterfall is not to be missed. For an easy walk, there are walking paths leading to a number of lookouts. For more of a challenging family hike, take the suspension bridge across the falls and the huge winding staircase to the bottom. If it’s not too chilly, stroll right to the edge of the falls into the “wet zone.” This was a favorite for our kids. For a real workout, take the stairs back to the top. A cable car is also available for folks who want to skip the stairs. TravelingMom Tip: Montmorency Falls are open year round. If you are visiting Québec for a winter vacation, I recommend a trip to the falls as well. Have a change of clothes handy if anyone ventures into the wet zone for too long. Traveling a bit further east from Québec City is Canyon Sainte-Ann. The impressive Sainte-Anne Falls carved this intricate canyon into the area’s bedrock. Encourage your kids to learn something new by reading the many information panels along the trails describing the area’s geography and history. Visitors can brave three suspension bridges across the gorge, the tallest of which is nearly 200 feet high. Thrill seekers can also try zip lines or rock climbing in the park. Rather keep your feet on the ground? There are walking paths throughout the park that are easily accessible for all. If you have the time and inclination, try hiking the entire length of the trail to see these amazing falls and canyon from every angle. About 2 hours should give you enough time to take photos and enjoy the views along the way. TravelingMom Tip: Canyon Saint Anne is open from May to October. There are picnic areas, and a restaurant to enjoy lunch or a snack. 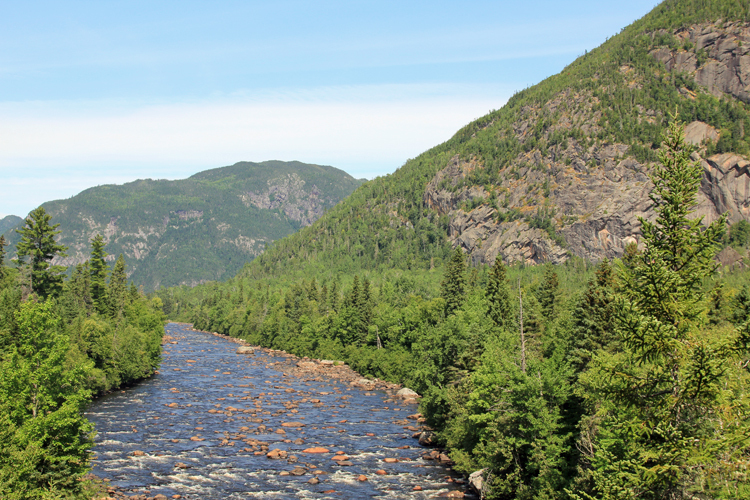 Only 2 hours from Québec City, the beauty of this park will leave you speechless. Adventurous hikers can reach the highest summit in the park with an elevation gain of nearly 3,500 feet. The views from this point are supposed to be spectacular, but it’s about a 6-hour time commitment to complete. The hike along the river was more our speed. The kids loved selecting walking sticks, skipping stones and dipping tired feet in the cool water. I highly recommend at least one night of camping here. The night sky is like a brilliant planetarium show. My son wanted to stay up all night just to watch the stars. This park also provides kayak and bicycle rentals (5 miles of biking trails). We kayaked along the river for a few hours. The views of the surrounding forest and cliffs were stunning. TravelingMom Tip: Cars are not allowed in the park, except to a reserved campsite. Visitors park at the gate and take a bus to points in the park and the Service Center. Before we discovered this park, I had no idea there were fjords in Canada. This relatively unknown gem is worth the extra drive to get there. It’s about 3 hours from Québec City. We set aside most of the day to take on the challenging 7-kilometer hike to the top of the cliffs at Cap Éternité. There were a few “are we there yet?” whines on this hike, but the views at the end made the challenge worthwhile. We even spotted some native beluga whales across the Sagueney River. A visit to the snack bar for ice cream was a fitting reward once we made it back to sea level. TravelingMom Tip: Since this area is more remote, be prepared for very little English to be spoken. This makes it even more charming in my eyes. So don’t tell too many friends about this spot. We don’t want it to get spoiled by throngs of tourists. We took a ferry to the other side of the St. Lawrence River to our next destination at Bic National Park. Similar to Fjord-du-Sanguenay, this park is secluded away from the larger tourist crowds. The area has a mix of landscapes including bays, coves, islands and mountains. It’s easy to spot a variety of wildlife like seabirds and seals. Playing in the mud along the marshes was a favorite activity for my kids. The highest point in the park is Pic Champlain. At 1,140 feet, it boasts stunning views of the surrounding area. My daughter said she felt like we were up in the sky with the birds. If you are feeling adventurous, you can hike to the summit, but there is also a shuttle bus available. We did a combination of both. TravelingMom Tip: If you decide to camp here, select one of the areas close to the water. Campsites near the park entrance are rather noisy with both truck and train noise. In choosing hikes for your family, consider the ages, abilities and temperament of your children. Younger children will likely need shorter hikes with more rest breaks. Older children may want more challenging hikes. 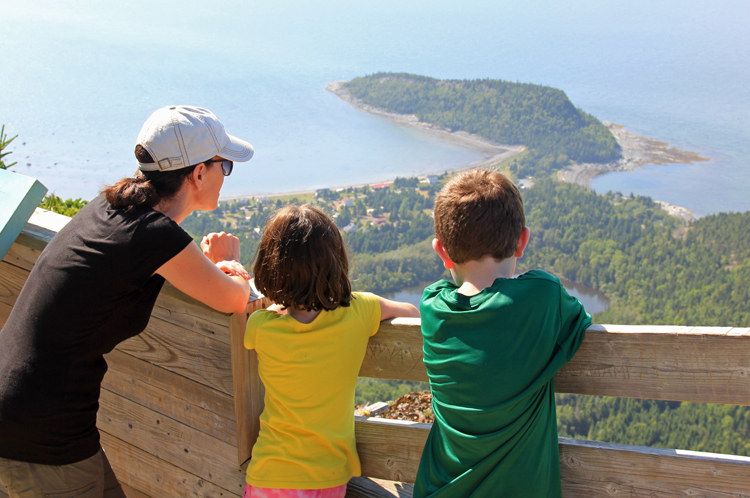 Ask your children about their preferences when selecting your family hikes as well. For example, my kids love to be near the water so each of our hiking destinations had a main water feature. 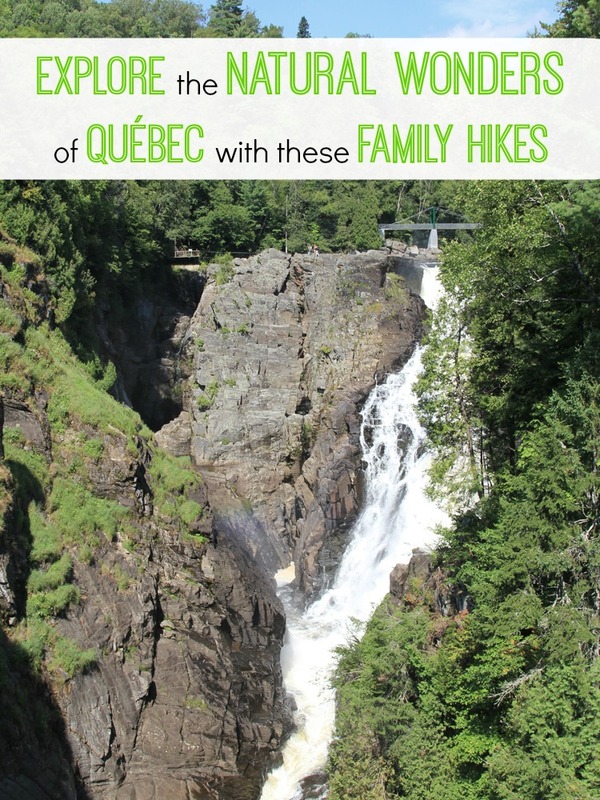 These are by far our favorite areas to hike in Québec. We can’t wait to return and explore more of the area. Where do you like to hike with your family? Let us know in the comments section below! Oh, that all sounds so relaxing! Some of my husbands family lives in Canada and I’ve always wanted to take a trip to visit this area. It just looks so calming, and hiking is something I would love to do more of! Great article, thank you for sharing! All these hikes look gorgeous! I have a one year old, but haven’t taken him hiking yet. I plan on changing that this summer though. I’m glad things like the Ergo exist to make toting around kids easier and make hiking possible. Imagine, I live so close to Quebec and have never been to Montmorency Falls Park! We are traveling all the way to Iceland to see many of the sites that I could see right in Quebec. Bucket List. This looks like an amazing trip! So much natural beauty. Wow! These destinations look amazing! It’d be a great experience to visit them with the kids. They love the outdoors! Wow! That waterfall and those views are amazing! I had no idea. I am not a hiker, but my son and daughter-in-law would love this. Beautiful.